Handmade Silver Jewellery It Is - Decision Made! Home / Stories / Handmade Silver Jewellery It Is – Decision Made! Decision Made – Handmade Silver Jewellery it is! and after much discussion we decided to act on those initial thoughts, handmade silver jewellery it is! Both of us had always harboured a desire to create our own business but hadn’t found the right thing. This though seemed just that, and Maison de Siam was borne. Alex was lucky enough to have the opportunity to move to Bangkok with her job and we leapt at the chance. Thailand has always been a favourite of ours, with several backpacking trips whilst younger. We love travelling and when we moved here were determined to see as much of Thailand and the region as we could. It was on one of these weekends away, exploring the country we stumbled on the amazing handmade silver jewellery around the Chiang Mai area in the North of Thailand. We decided if we were going to do it, we were going to do it properly, so Matt gave up his job as an Event Manager for a PR agency in Bangkok and set to work on learning all about online businesses, social media and small business marketing. Travel is a passion of ours. 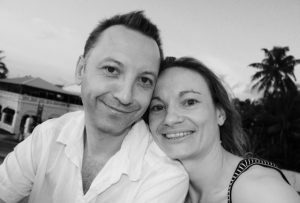 We met 11 years ago working for the charity Raleigh International in the jungles of Borneo and afterwards toured around South East Asia before a ski season in New Zealand. We are making the most of the opportunity of living in this amazing country and region. Getting away at weekends and exploring, whether its scuba diving off the beautiful coast, or visiting temples in Chiang Mai or exploring the amazing restaurants in Bangkok. We also dabble in sport and since moving to Bangkok have taken up the seemingly addictive sport of triathlons. This keeps us out of trouble and healthy, even if our friends think we are mad. Entering a half ironman was indeed mad, but lets see how it goes! Why The Name Maison de Siam? France is very close to our hearts. We both spent time there when we were young and even got married in Provence. One day we would love to move to the south of the country to live a more rural life. This may sound like a far cry from busy Bangkok and it would be, but we love change and experiencing the world, so it works for us! If we can see the world while bringing this beautiful handmade silver jewellery to a wider audience AND help people, then it seems like the perfect situation!